Janelle In Real Life: maxi & stripes. Hey friends! Here's what I wore to church yesterday while we wrangled a bunch of six year olds and taught them about faith. They also were very fond of our 11 month old... I think Carson has some new friends. I love this maxi and how comfy this outfit was. I also love when an outfit calls for simple accessories... so fresh. Also guys, what do you want to see more of on here? I truly appreciate you all for reading and I want to add more material that you're interested in! So please enlighten me. Tutorials? Style how-to's? Other things? Leave a comment and let me know! Such a pretty maxi! Love your necklace too! Thank you! the necklace was a steal for $3! Thank you! I love that skirt. I am your newest follower! Love love your blog! I'd love to team up with you and do a collaboration sometime in the fall! I'm following you as well! I'd love to do a collaboration sometime, just email me at janelleinreallife@gmail.com! Thanks! I find myself wearing it all the time! That skirt is fantastic! Cobalt is one of my favorite colors. 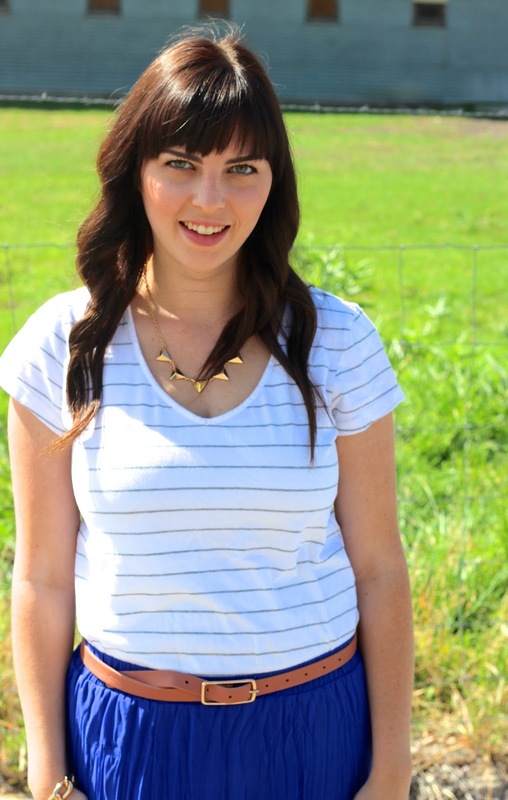 And what a great idea to pair it with stripes. Thank you! I so love this skirt. Thank you! I really love this maxi skirt. The maxi skirt is gorgeous. Great outfit! Thanks! I'm a big fan of the cobalt blue! 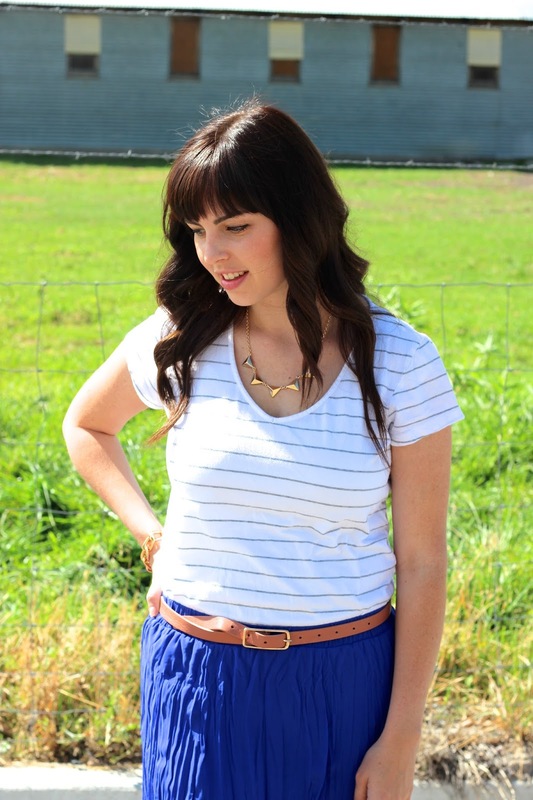 The bold cobalt blue is such a pretty color on you! Thank you! It's becoming one of my favorite colors for sure. This is a great look! And the necklace gives it just that little added attitude/kick/ I don't know what word I'm looking for bc it's late- but I like it! Stopping by from the Trend Spin Link up! Thanks so much! 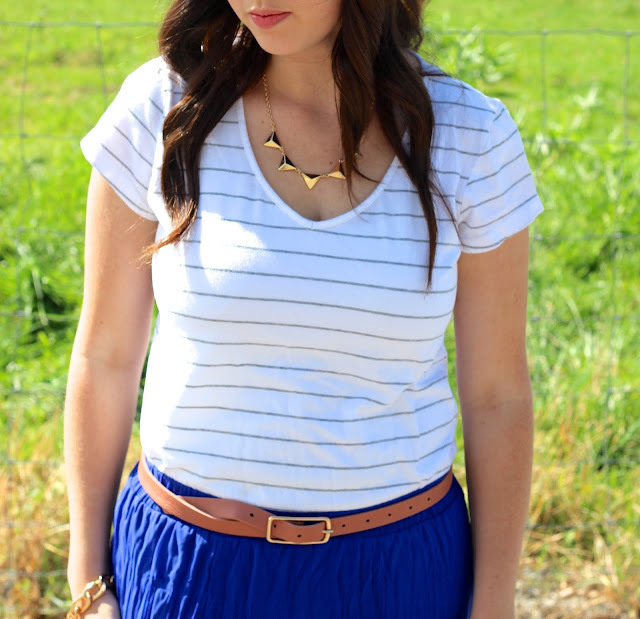 I love when a simple necklace adds a lot of flare! I LOVE LOVE LOVE this! I am a new follower of yours, and I would love to team up with you one day! I love this look! Maxis are my absolute favorite because they are so comfy, but they look so put together. I love the necklace you added too! Thank you! 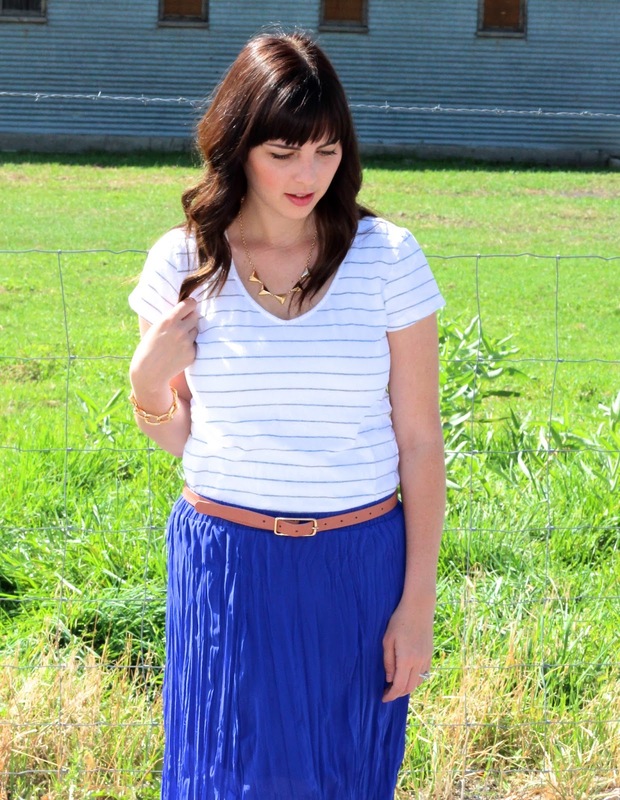 I don't know what I would do without maxi skirts... they are the best! Looking beautiful as always! What boutique did you buy that maxi from? I love the pleated texture! Aw, thanks! I got it from The Nest on Main Street... it's a boutique in Springville! What a beautiful color on you! 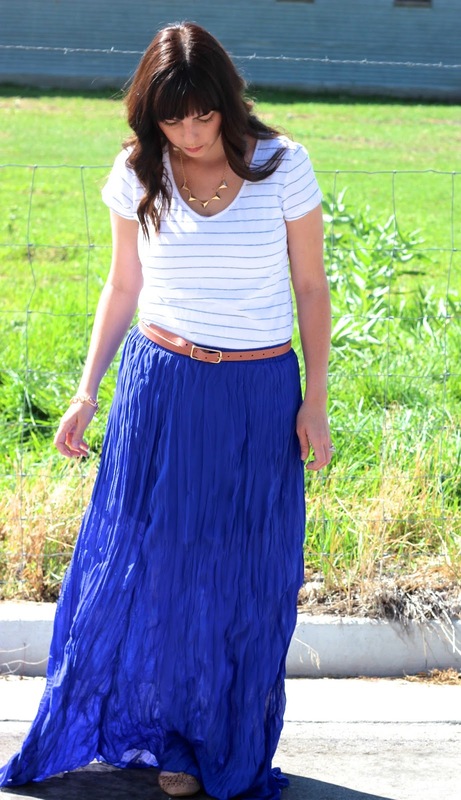 I love a good maxi skirt! 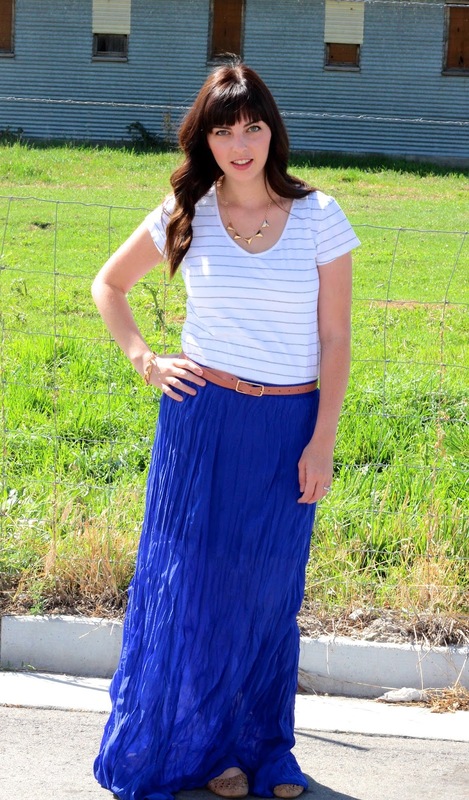 This blue maxi is so so perfect on you!